Until a few years ago, Dean got his red grapes from vineyards in other parts of the Columbia Valley, because Chelan is thought to be too cool to ripen red grapes. But the Neffs resisted popular opinion and planted Syrah and Malbec in their aptly named Defiance Vineyard, just outside their tasting room overlooking Lake Chelan. Heather works with Viognier from this vineyard, and other white grapes, including Riesling, from the Neffs’ other vineyard blocks—Rocky Mother and Stone’s Throw—near Pateros, north of Chelan. Many other couples in the Washington wine industry work together in different ways. Some, like Kay Simon and Clay Mackey of Chinook Wines in Prosser, balance each other by focusing on different tasks. Clay sources fruit and works the vineyards, making sure Kay gets the best fruit for her award-winning wines. Poppie and James Mantone of Syncline Cellars in Lyle and Nina Buty Foster and Caleb Foster of Buty Winery in Walla Walla share every aspect of their businesses—working in the winery, collaborating on making and blending wines, as well as marketing and sales. And some couples work for completely different wineries. 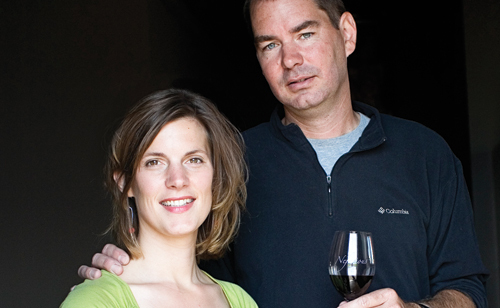 Marie-Eve Gilla and Gilles Nicault, for example, are award-winning winemakers for two different Walla Walla wineries—Forgeron and Long Shadows, respectively. Whether winemaking couples collaborate through the whole process or give each other freedom in the winery, they do what works for them. “We don’t have any input into each other’s process, so when it comes time to tasting each other’s wines, we can be totally honest,” says Heather Neff. In any case, the process is a labor of love in more ways than one, and the results give lucky wine drinkers some of Washington’s most delicious wines.